Listing of all the events coming up at Glynde Place. If you would like to buy a season ticket for all three concerts, which will give you reserved seating and 10% discount on ticket price, then please see the main GPCS webpage for details. Andrei Ionita, born in 1994 in Bucharest, began piano lessons aged five and then took cello lessons three years later. He studied under Ani-Marie Paladi at the Josef Sava Music School in Bucharest and Professor Jens Peter Maintz at the Universität der Künste, Berlin. In 2013 he won First Prize at the Arum Khachaturian International Competition; in 2014 Second Prize and Special Prize for Interpretation at the ARD Music Competition; in 2015 he gained international recognition as winner of First Prize at the International Tchaikovsky Competition in Moscow. Andrei is a scholarship recipient of the Deutsche Stiftung Musikleben. 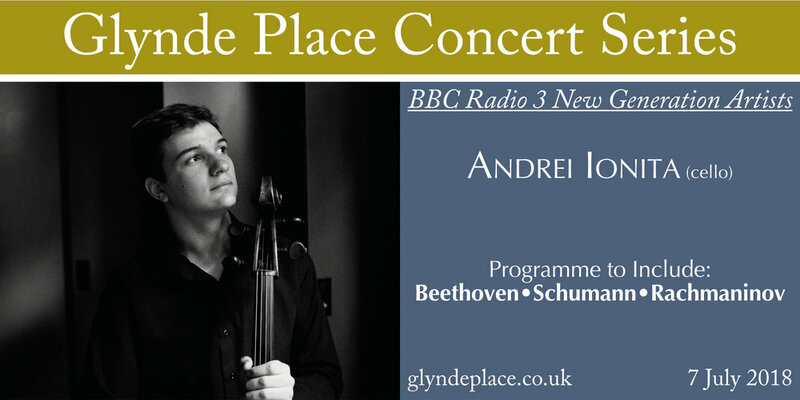 Andrei was named a BBC Radio 3 New Generation for 2016-2018, involving broadcast, recital and orchestral soloist opportunities throughout the UK. He plays a Giovanni Battista Rogeri cello dated 1671, generously on loan from the Deutsche Stiftung Musikleben foundation. Sign up with your email address to receive news and updates of events happening at Glynde Place.